Practice plans for youth sports that provide detailed activities and drills broken down step-by-step help set coaches apart from their peers for several reasons. Below are some short descriptions of our titles. Don’t forget to click on the links to see sample plans, excerpts and more! Specify coaching concepts to address and the order to address them in – the right stuff at the right time. Generate team improvement rapidly. The biggest winners are the players! Save time. You won’t have to start from scratch; just review and tweak as needed for your team. Print out the plan for your upcoming practice and bring it with you to use as your guide. Enable you to “live in the moment” at practices by being focused on the task at hand vs. having to worry about what to do next. The following ebook practice plans are available as an instant digital download in PDF format (works on Macs or PCs). 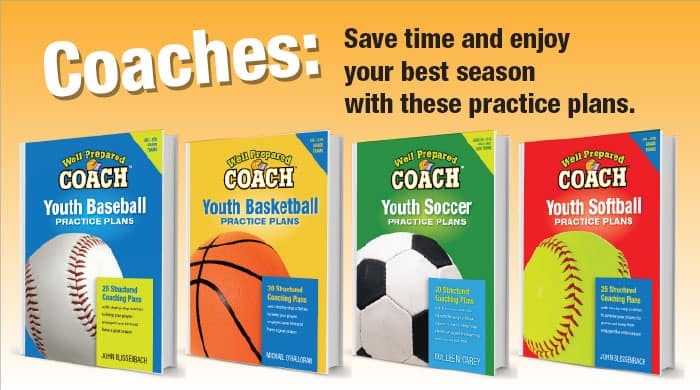 30, ninety‐minute practice plans for 4th – 8th grade teams. Exercises, explanations and teaching points for a complete season. 30 agendas and talking points for pre-practice meetings – a critical time to connect with your team. A “Driveway Workout” for your players’ off‐season efforts. Proven inbounds plays and sideline plays. 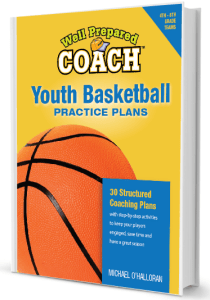 Learn more about this youth basketball coaching resource here. Football coach and author Dave Cisar believes that you can compete at a very high level (even dominate), have fun and teach great fundamentals. He shows you how to do it the “Winning Youth Football” way. It’s a detailed, step-by-step ebook program that shows you how to build a competitive youth football team while having fun along the way. Cisar’s version of the Single Wing Offense is featured including: football plays, youth football offensive and defensive playbook, special teams, personnel descriptions, adjustments, blocking schemes and drills, detailed football play implementation and footwork, detailed football practice plans, keys, game day play calling and scouting are all there. You get his football schemes, packages, position descriptions, player evaluations, football drills, progressions, practice methodology and program management. Learn more about this youth football coaching resource. With this complete season’s worth of softball practice plan, you’ll save time, work with a proven system, and get the most from your players. You can create a season for your players and team that other coaches just dream of. 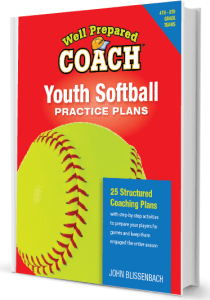 If you’ve never had any formal softball coaching training or just want to improve your chances at a great softball season for your players and their families, this softball practice plan ebook is the solution for you. With the “heavy lifting” done for you, you can review the practice plan minutes before your scheduled time; and be set to go. You’ll be well-prepared and have more fun with the stress removed of planning each practice. You’ll notice the difference. Your team parents will see the results. And, most importantly, your players will learn the game in a more complete fashion. 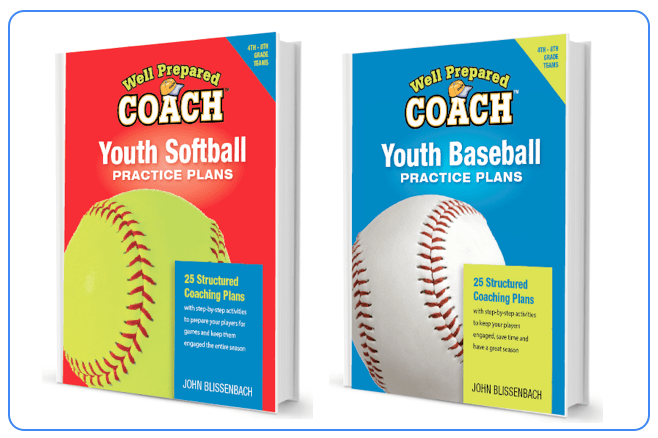 Learn more about this youth softball coaching resource. If you want to have fun, structured, fast‐moving practices loaded with fundamentals, then this book is for you. As you enter a new baseball season, three things are certain; your players will be diverse in their skills and understanding of the game, there is great deal your players will need to learn, and finally, you will have a limited amount of time to prepare for each practice, as well as a limited amount of time during practice. How your players spend their time during practice will determine the success of your team’s season. What your players do during practice and when they do it is entirely up to you. Your players are counting on you to be prepared so they can be prepared. It will make your coaching job a lot easier. This ebook guide includes: agendas and teaching points for twenty‐five, 90‐minute practices, appendixes for special baseball situations, and twenty‐five, 10‐minute, pre‐practice meetings. 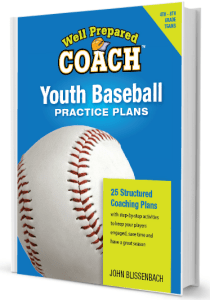 Learn more about this youth baseball coaching resource. Author Colleen Carey, twice “MIAC Conference Coach of the Year” at St. Thomas, outlines a structured season plan of practices for youth soccer coaches (12U – 8U). With over 90 diagrams, you’ll quickly understand the carefully crafted skills and activities to improve your players and engage the team. 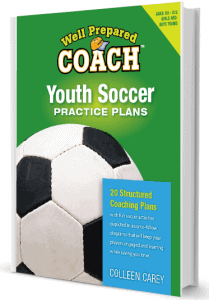 Save time, engage your players and have a great season with Youth Soccer Practice Plans. Learn more about youth soccer practice plans. 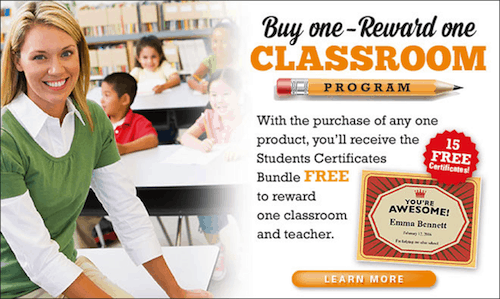 Learn more by clicking on image.